Cosmetic bonding in the Bronx uses composite fillings, also known as white fillings, for reshaping teeth. There are many reasons for needing teeth reshaping or teeth contouring, including to repair broken teeth and crooked teeth. How long do composite fillings last? They last long enough — around 10 years — to make dental bonding costs and composite fillings costs affordable in the long term. Dental bonding refers to the procedure that bonds a composite resin to your teeth for aesthetic or bite purposes. The composite material is made from a durable plastic resin in tooth-colored shades. The resin’s shade is matched to your surrounding teeth to provide a natural look that restores — or improves —your smile. 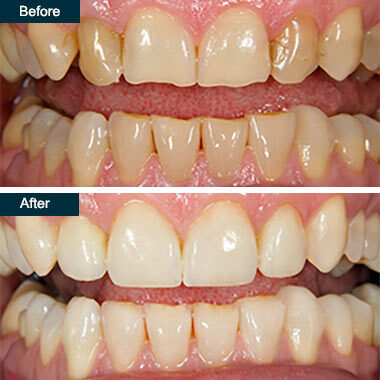 For cosmetic bonding in the Bronx, the resin is applied directly to your tooth and sculpted to its surface. Through the curing process, the material chemically bonds to your tooth. Dental bonding can also act as a substitute for fillings in a cavity. Composite filling is the most common and least expensive form of cosmetic dentistry. Because of its prevalent use, your dental bonding cost is relatively low — $100 to $400 per tooth. Since the bonding is applied directly to the tooth, you often require no anesthesia. Your dentist (open on Sundays) removes as little tooth enamel as possible. The process usually only requires one visit for the full treatment, unless multiple teeth are involved. As with any dental procedure, there are some disadvantages. Composite fillings are not as strong as your natural teeth, so biting on hard or foreign objects can chip the resin material. How long do composite fillings last? You can expect to keep them intact for three to 10 years, depending on where they’re located in your mouth and the care you provide. Also, composite fillings aren’t as stain resistant as other fillings. The dental bonding material’s versatility contributes to its widespread use. It’s well suited for altering or enhancing your teeth, improving function and adding confidence to your smile. Do you have any questions about the dental bonding (cosmetic teeth bonding) procedure in the Bronx NYC? For more information or to schedule an appointment with the best rated cosmetic dentist in the Bronx NYC please contact our dental clinic for a consultation.